Glorious, dramatic and ephemeral. Enormous satiny, crepe-like blooms early in the summer. Long lived and very hardy, unfortunately the blooms do not last very long. Grow these very showy plants in full sun and well-drained soil. After flowering the foliage will die back and the plant will completely retreat underground until the coolness of fall brings a small new flush of foliage. 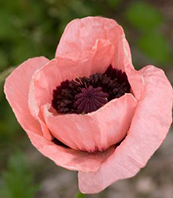 Plant a bushy perennial in front of your poppy to camouflage its disappearance.